Cromology’s new, 22,000 m² distribution centre in the locality of San Miniato (Italy) is sectored into eight different zones for security reasons, which is one of the company’s priorities. Operations are mainly organised depending on the distribution channel that each product is directed to, in order to streamline tasks for reception and dispatch. 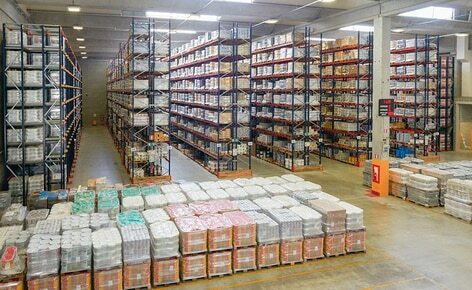 Mecalux has supplied storage systems suited to the different areas. Cromology Italia is a leading multinational company in the production of decorative paints that includes brands like MaxMeyer, MaxMeyer DIY, Baldini Vernici, Duco, Lo Specialista di MisterColor, Mistercolor, Settef, Cepro, Viero, Tollens and Paint à Porter. The company needed to strengthen its leadership within Italy, guaranteeing their service quality and reducing logistics costs. They asked for the collaboration of Mecalux to find a solution, which would allow them to organise operations and expedite the supply of their main market. Target market: is mainly Italy, although it is true that a part of the goods are exported to other countries (both operations are separated). Distribution of the product: depending on whether the product is aimed at wholesale or retail sale. Receipt and dispatch: entry and exit tasks were separated into different areas and docks. This way there is no interference between the two operations. All areas have very similar characteristics. They are composed of drive-in racking for consumer product reserves and conventional racks for medium and low consumption items, dedicating the lower levels to picking. Operators use order-picking machines placed at an average height that facilitate the access to the goods in an ergonomic positioning. To ensure the safety of both the employees and the elements that make up the installation is one of the most important prerequisites for Cromology. Their goal is to reduce the number of accidents to zero, something that is present and visible in all their production centres and facilities. 9 m high conventional racks form the central part of the warehouse. This very versatile system allows the deposit of any type, volume and variable weight load unit, including pallets and other smaller sized load units. In all the storage areas in the logistics centre picking is done directly from the pallets at the lower levels. Operators use order picker machines that reach 3 m high. For lower consumption products, shelves with electro welded wire mesh were set up and also separators. Reserve stock is stored at the higher levels. As an additional safety measure, an underpass that passes through the racks crosswise was opened up and fulfils the function of the emergency exit, in addition to facilitating the flow of goods. The bays on top of the security underpass are lined with mesh to prevent the fall of materials. The sides of each warehouse area were arranged with 9 m high drive-in racks for the deposit of consumer products. The racking levels are composed of high resistance support rails on both sides, manufactured in galvanised steel sheet and triangular in shape to position the pallets correctly, occupying only 50 mm in height. In the entrances, centring devices designed to facilitate the introduction of the load units with reach trucks were installed. In front of the loading docks, the preload area was set up on the ground level that is devoted to getting pallets ready for shipment. The consolidated goods accumulate in this area and subsequently operators move them to the transport and distribution trucks. Optimal logistics management: the sectoring of the warehouse for security reasons also allows the organisation of operations and the provision of optimal, high quality service. Speedy order preparation: the direct access to goods and the positioning of order pickers facilitates the ergonomic work of operators. Installation safety: the company has equipped the warehouse with various safety and support devices on the handling machines to ensure the safety of the operators.